Russia has conducted the final orbital launch of 2011, as their Soyuz-2-1a/Fregat deploying six Globalstar communications satellites into orbit on Wednesday on behalf of Arianespace and Starsem. Liftoff was on schedule at 17:09:01 UTC (23:09 local time), from Site 31/6 of the Baikonur Cosmodrome in Kazakhstan. Globalstar is one of three major networks of commercial communications satellites in low Earth orbit, along with Iridium and Orbcomm. Like Iridium, and unlike Orbcomm, Globalstar is designed to transmit audio communications for satellite telephony.Globalstar provides coverage of the Americas, Europe, parts of Russia and Asia, Australia and New Zealand. When completed, the second generation network of satellites will be made up of 32 operational satellites in circular orbits 1,414 kilometres in altitude, inclined at 52 degrees to the equator.Launches of second-generation Globalstar satellites began in October 2010, and Wednesday’s launch was the third group of six satellites to be placed into orbit. 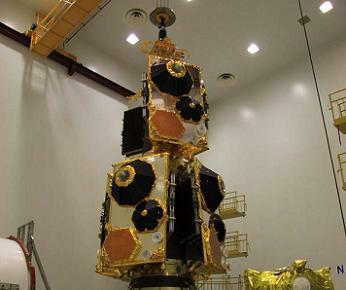 The second-generation Globalstar constellation is intended to replace the existing first-generation constellation, which began deployment in 1998. Launches were conducted in groups of four, on Delta II and Soyuz rockets, with a single launch of twelve satellites on a Zenit-2, however the Zenit launch failed.The first-generation satellites were built by Space Systems/Loral, based around the LS-400 bus, with a communications payload built by Alenia Spazio. The constellation consisted of forty eight operational satellites, and four spares. Including the twelve satellites which failed to achieve orbit, this resulted in sixty four being launched between 1998 and 2000, by means of seven Delta II 7420, and six Soyuz-U/Ikar rockets. The satellites had a design life of seven and a half years, and in 2007 eight replacement satellites were launched using Soyuz-FG/Fregat rockets. The third Globalstar launch, conducted on 9 February 1999, marked the first commercial launch of the Soyuz rocket, and the first launch to be conducted by Starsem; the company conducting Wednesday’s launch. That Soyuz flew in the Soyuz-U/Ikar configuration, using an older version of the Soyuz rocket, and an upper stage derived from the Yantar reconnaissance satellite. The Ikar upper stage was short-lived; it was only used for the six Globalstar launches before being retired in favour of the Fregat. The new Globalstar satellites were constructed by Thales Alenia Space, under a contract signed in 2006, and are each equipped with sixteen transponders operating in the C and S bands of the IEEE spectrum (E-H bands of the NATO spectrum). 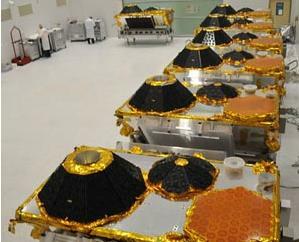 Each spacecraft generates power by means of two solar arrays, which can produce 2.4 kilowatts of power. Three-axis control is used to ensure that the satellites retain the correct attitude for relaying communications and orienting their solar arrays towards the sun. The satellites are expected to operate for fifteen years. Soyuz-2 is a modernised variant of the Soyuz rocket, itself a derivative of the R-7 Semyorka, the world’s first intercontinental ballistic missile. The R-7 made its first flight in 1957, and a modified version was used to launch Sputnik 1, the first artificial satellite, later that year. In addition to Soyuz, the R-7 has served as the basis of the Vostok, Molniya and Voskhod rockets as well as several other variants which made small numbers of flights. Vostok rockets launched early Soviet manned spaceflights, reconnaissance satellites, and a modified version launched the first Soviet lunar probes. Molniya was used to launch missions beyond Earth orbit, as well as military, communications and scientific satellites into high Earth orbits. The Voskhod rocket, which first flew in November 1964, was the predecessor to the Soyuz. It incorporated the Blok I third stage developed for the Molniya rocket, powered by an RD-0108 engine. Voskhod was used to launch reconnaissance satellites, and missions of the manned Voskhod programme. The Soyuz, meaning “Union”, first flew on 28 October 1966. Derived from the Voskhod, it incorporated upgraded engines, including an RD-0110 on the third stage, as well as a lower-mass and improved telemetry system. The original Soyuz was used exclusively for launches of Soyuz spacecraft, both manned and unmanned. Not including one which exploded on its launch pad after its launch had been delayed, thirty one were launched, the last of which flew in 1975 carrying the Soyuz 23 spacecraft. Between 1970 and 1971, three Soyuz-L rockets were launched, incorporating reinforcements to the core stages and a larger payload fairing to accommodate prototypes of the LK spacecraft, the spacecraft the Soviet Union intended to use to land men on the Moon. Another Soyuz variant, the Soyuz-M, was developed to launch the Soyuz 7K-VI; the military version of the Soyuz spacecraft, which was heavier than the civilian version. After the cancellation of the military Soyuz programme, eight Soyuz-M rockets were used to launch Zenit-4MT reconnaissance satellites, with launches occurring between 1971 and 1976. The Soyuz-U was developed as a standardised launch system, to replace the Voskhod and Soyuz and provide commonality with the Molniya-M. It first flew in May 1973, and in 1976 the original Soyuz, Soyuz-M and Voskhod were all retired, with subsequent launches of their payloads being conducted by Soyuz-U rockets. The Soyuz-U2 configuration, which was optimised to use synthetic propellant allowing it to carry more payload, was introduced in 1982, and used for around 90 launches before being retired in 1995. With around 750 flights, the Soyuz-U is the most-flown orbital launch system ever developed. It remains in service, and in the last few years it has mostly been used to launch Progress missions to the International Space Station, as well as occasional military payloads. Recent launches have used the Soyuz-U PVB version, which features additional fireproofing. In 2001, the Soyuz-FG, which featured a new fuel injection system, was introduced, providing an increased payload capacity. After three test flights carrying Progress spacecraft, the Soyuz-FG began launching manned Soyuz-TMA spacecraft to the ISS, a role which it continues to perform. The Soyuz-2 features modernised engines and digital flight controls. There are three different configurations; the Soyuz-2-1a, 2-1b and 2-1v, with the 2-1a and b using different third stage engines. 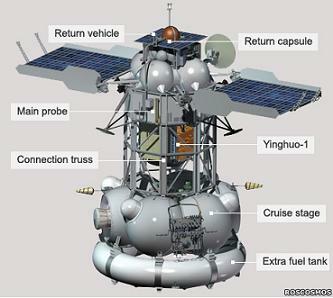 The Soyuz-2-1v is a two-stage vehicle, without the first stage used in the other configurations, and with an NK-33 engine replacing the RD-108 used on the second stage of the other configurations. It is expected to make its maiden flight next year. The Soyuz-ST is a derivative of the Soyuz-2 optimised for launching from the Centre Spatial Guyanais, and equipped with a self-destruct system to meet range safety requirements there. The Soyuz-ST made its first launch in October, and can fly in two configurations; the Soyuz-STA and STB, based on the Soyuz-2-1a and 2-1b respectively. The Soyuz-2 made its maiden flight in 2004, in the Soyuz-2-1a configuration. It carried an obsolete Zenit-8 reconnaissance satellite, refitted with test instrumentation, on a suborbital trajectory. It is not entirely clear whether the mission was intended to be suborbital, or whether the rocket actually failed to achieve orbit. The first launch into orbit occurred in October 2006, when a Soyuz-2-1a/Fregat deployed the MetOp-A weather satellite. The Soyuz-2-1b made its maiden flight later the same year, carrying the COROT exoplanet detection satellite. Under Russian stage numbering, the booster rockets which augment the core stage’s thrust during the first 118 seconds of flight are considered to be its first stage, even though the core, or second stage, ignites at the same time. The first stage consists of four strap-ons, designated Blok-B, V, G and D, which are powered each powered by an RD-107A engine. The first stages are attached around the second stage, or Blok-A, which is powered by a single RD-108A. All of the first three stages of the Soyuz burn RP-1 propellant, using liquid oxygen as an oxidiser. The first and second stages ignite about 17-20 seconds before launch, and slowly build up thrust. Once full thrust has been achieved, the launch pad’s four swing arms will release the rocket to begin its ascent to orbit. Eight seconds after lifting off, the rocket will pitch over. After burning for 118.25 seconds, the first stage will be jettisoned, forming a pattern in the sky known as the “Cross of Korolev” as the four boosters separate from the core. The second stage will continue to burn for another 168.94 seconds before separating from the third stage, which will have ignited about two seconds ahead of staging. The third stage is a Blok-I, which is powered by a single RD-0110 engine. It is expected to burn for 243.9 seconds, before Fregat separation occurs. Near the start of third stage flight, about 9.66 seconds after second stage separation, the “aft section” or interstage will be jettisoned from the Blok-I. Fairing separation will also occur during third stage flight, about four minutes and fifty eight seconds after liftoff. The Fregat upper stage, which is propelled by unsymmetrical dimethylhydrazine and nitrogen tetroxide fuelling an S5.98M engine, will be used to place the Globalstar satellites into their target orbit. The Fregat, which is making its thirty first flight, has been used as a fourth stage on Soyuz-U, Soyuz-FG and Soyuz-2 rockets, and also as the third stage of the Zenit-3F. Fregat made its first flight in first flew in 2000, on a Soyuz-U rocket carrying the IRDT inflatable heat shield experiment. The Fregat was also equipped with a prototype heat shield, and was intended to be recovered if possible; however it could not be found after reentry. The heat shield was a one-off on the test flight; Fregats are generally allowed to burn up in the atmosphere. Only two launches of Fregats have failed to date. One of these, last week’s Soyuz-2-1b launch, failed before the Fregat had even fired, and the upper stage was not responsible for the anomaly. The other failure was caused by the Fregat; the May 2009 launch of the Meridian 2 satellite ended in failure after a programming error led to the Fregat expending propellant at a greater rate than it should have, and it ran out of fuel during the second of three planned burns. The propulsion system of the Fobos-Grunt spacecraft, which failed to depart Earth orbit on a mission to Mars’ moon Phobos, was also based on the Fregat, however it was modified, and it is unclear what the cause of the spacecraft’s failure was. During Wednesday’s launch, the Fregat made three burns. The first burn occurred immediately after separation from the Soyuz, taking the spacecraft and upper stage into a transfer orbit, with a perigee of 210 kilometres and an apogee of 923 kilometres, inclined at 51.7 degrees. The second, fifty minutes later, resulted in an orbit with a perigee of 928 kilometres, an apogee of 933 kilometres, and 52 degrees of inclination. One hour, 38 minutes and 40 seconds after liftoff, the first two satellites separated from the upper section of their dispenser. The remaining four satellites separated from the lower section 100 seconds later. The Fregat will subsequently be deorbited and reenter the atmosphere over the south Pacific. The launch went ahead just five days after a Soyuz-2-1b failed to place a Meridian communications satellite into orbit; initial investigation has indicated that the failure was caused by the rocket’s third stage engine, which differs from that used on the Soyuz-2-1a. The Soyuz-2-1a uses the older RD-0110 engine, which has been used on Soyuz and Molniya rockets since the 1960s, whereas the Soyuz-2-1b uses the more modern RD-0124, which uses a closed-cycle oxidiser system to power its turbopumps, giving the engine a higher specific impulse. Wednesday’s launch occurred from pad 6 of Site 31 at the Baikonur Cosmodrome. Site 31/6 is one of two Soyuz launch pads at the Baikonur Cosmodrome, along with Site 1/5. Currently, it is the only one of the two pads used for Soyuz-2 launches, whilst the older Soyuz-U and Soyuz-FG models can fly from either pad. The first launch from Site 31/6 was a test of an R-7A missile in January 1961. The first orbital launch from the complex occurred in November 1964, when the first of two Polyot, or Sputnik 11A59, carrier rockets place the Polyot-1 satellite into orbit. The pad was subsequently used for launches of Vostok and Voskhod rockets, including the launch of Kosmos 57, a test of the Voskhod-3KD spacecraft to be used for the Voskhod 2 mission. On 12 November 1965, a Molniya-M launched Venera 2 from Site 31, before another launched Venera 3 from the pad four days later. A third Venera launch a week later failed, with the spacecraft remaining in Earth orbit as Kosmos 96. In 1965 the Soyuz/Vostok 11A510 rocket, comprised of the first two stages of the Soyuz, with the third stage of a Vostok, made the first of two launches from Site 31. 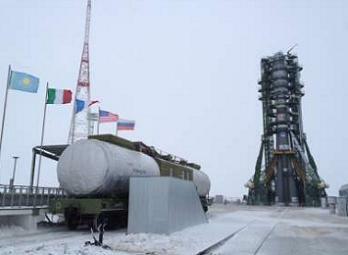 The next year, on 28 November, the pad was the site of the maiden flight of the full Soyuz rocket, the 11A511. That launch also marked the maiden flight of the Soyuz spacecraft, making an unmanned test designated Kosmos 133. Less than a month later the pad was the site of a major explosion, when the launch escape system of the second Soyuz was accidentally fired when the rocket was being defuelled after a scrubbed launch. At least one soldier was killed in the explosion, and no more launches occurred from Site 31 for the next six and a half months whilst the complex was rebuilt using parts from Site 16/2 at Plesetsk. The first manned launch from the complex was of Soyuz 3 in October 1968; the first manned spaceflight launched by the Soviet Union after the death of Vladimir Komarov aboard Soyuz 1 in 1967. It was subsequently used for Soyuz-U launches, although manned launches ended in 1984 with Soyuz T-12. All manned flights since have been launched form Site 1/5. Site 31 has also been used for all Soyuz launches from Baikonur using Fregat upper stages, and consequently most commercial Soyuz launches. This launch was the eighty fourth and last of 2011 intended to reach orbit; the most launches conducted in a year since 2000. Of the previous eighty three launches, seventy nine reached orbit, and seventy seven were successful. The launch of these six Globalstar satellites also marks the nineteenth launch of a Soyuz rocket in 2011, making it jointly the most-launched orbital launch system of the year. China’s Long March series of rockets also made 19 launches. Russia has, for the eleventh consecutive year, conducted more orbital launches than any other country. Including Wednesday’s launch, and across all flights of former Soviet rockets, thirty one successful launches have been made from thirty five attempts. These include a Zenit launched from the Odyssey platform by Sea Launch, and two Soyuz-ST launches from the Centre Spatial Guyanais in French Guiana, conducted by Arianespace. Russia’s activities in space in 2011 have been marred by four launch failures and the high-profile loss of the Fobos-Grunt probe shortly after launch. In February, a Rokot/Briz-KM rocket placed the Geo-IK-2 No.11 spacecraft, since redesignated Kosmos 2470, into a useless orbit. In August, a Proton-M/Briz-M failed to place the Ekspress-AM4 satellite into geosynchronous transfer orbit, instead leaving it in an orbit with an insufficiently high apogee, and then less than a week later a Soyuz-U failed to achieve orbit carrying the Progress M-12M cargo spacecraft bound for the International Space Station. Fobos-Grunt was successfully launched by a modified Zenit-2M rocket in November, however about two and a half hours after launch, the spacecraft failed to execute an orbit-raising manoeuvre, and contact with it was subsequently lost. Communications were briefly re-established in late November, however the spacecraft could not be commanded to depart its parking orbit, and it is expected to reenter early in the new year. The final Russian failure of the year came on Friday, when a Soyuz-2-1b failed to achieve orbit with a Meridian satellite. The next Soyuz launch is scheduled for 25 January, when a Soyuz-U will deploy the Progress M-14M spacecraft on a mission to resupply the International Space Station. Starsem’s next launch is planned for 23 May next year, when a Soyuz-2-1a with a Fregat upper stage will place the MetOp-B weather satellite into orbit. Another Globalstar launch is also expected to occur in 2012, in the second half of the year, again using a Soyuz-2-1a/Fregat. (Images via Roscosmos, Starsem and L2).